With all things, I find I get better results when I have a theme or goal to focus on. Here's a few shots from a recent photowalk I did with a friend in Vancouver's Main Street area. My friend smartly suggested we focus on typography. 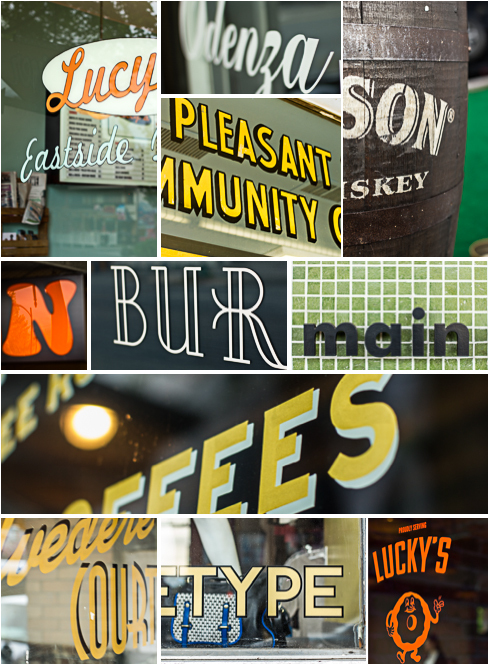 I love the mixture and retro feel of some of these typefaces. I wish I knew the names. Anyone? Can you guess the locations? I've wanted to come to the Guggenheim for about 10 years now. Although I've been in Spain quite a few times in that period, for whatever reason, it has not worked out so I'm thrilled that we are finally going.We had a pretty incredible morning already, setting off from Marqués de Riscal and visiting the nearby Ysios winery at La Guardia, which was designed by Calatrava. This place was designed to be photographed. With the incredible pyrenees as the backdrop, the undulating roof echoes their curves. There was not a single person there when we visited and we had a lovely few minutes on our own snapping pics and admiring. A bus tour arrived 5 minutes later so we moved on but I will really remember this special moment in La Rioja. The drive from Marques de Riscal to Bilbao is about 1.5 hours. We went as far as Vittoria-Gasteiz on lesser national routes which I'm so glad of - we really got to see some of the beautiful Rioja countryside and I'm inspired to visit here again with more time. Now we focussed on the point of our journey - 'the Gugg'. Arriving in Bilbao was pretty easy, the museum is well sign-posted. Tip - if you can, park across the river from the Guggenheim. You get a beautiful view from here and can photograph it before walking over the bridge to get a closer look. The sunlight on the fish scales dances and changes as you move and as the sun moves. Again, what can I really say on this one? It's as incredible as I remember from photos but I'm pinching myself because I can't believe I'm actually here. Every way you look at the building you get a different view or angle. I think you could see it forever and see something new every time. We walk around to look at 'El Perrito', Jeff Koon's dog sculpture which is hilarious and cute. Inside, I wonder if anyone looks at the art, the building is so incredible. It's covered in glass on one side so you get a beautiful view of the river from inside. The audio guide tells me that the central atrium is the heart of the building and that the adjacent galleries are the veins. All lead back to the heart so you visit here several times during your visit. Outside the public art installations are wonderful and seem to complement this already imposing building perfectly. I love the spider and the bullrushes which look like Koons as well. The day is really hot and it's just lovely to walk around and look at this thing, this shining tower in the sun. On the Road Again It's Tuesday. We left Barcelona yesterday and now find ourselves in Marqués de Riscal, near the small town of El Ciego. For those of you who have not heard, Frank Gehry designed a small hotel here. Even if you aren't an architecture fan, you may have seen it if you followed On the Road Again, on PBS. So this is somewhat of a 'station of the cross' on our way to the Guggeheim in Bilbao. For me it's a definite Pilgrimage having been a Frank Gehry fan for some time. The initial part of the drive out of Barcelona on AP2 - is fairly boring. You hit the A68 and then head for Zaragoza, Logrono. Lunch time happened in a roadside cafe service station. Delicious. We kept it simple, bocadillos of chorizo and spanish potato omelette, tortilla. Mmh, mmh good! In Spain, even fast food, is good food. The countryside changes as you come into Navarra and La Rioja and becomes very lush and green, rolling wine country. El Ciego is just inside the border of Pais Vasco aka Euskadi to the Basques. There is no point in me describing the marvel that awaits you when you arrive at Marques de Riscal. Actually - I do want to talk more about this...but I need to get organized with pictures etc to do it justice so expect a follow up but suffice it to say...I LOVE! Wine Tour There was tour of the winery starting right away so we jumped on board. The hotel was described as having been designed by the 'Canadian Architect Frank Gehry' which of course he is, but it isn't always mentioned so we puffed up our chests a little bit with pride! We toured both the modern winery and the two older ones which are used only for storage and some aging. The older wineries were really impressive, beautiful buildings. It was really what you expect an old world winery to be. They only make Reds in El Ciego - no Crianza - just Reserva and Gran Reserva. This is of course, Rioja appellation. Marques de Riscal do have another winery in Rueda where they make a Verdejo and some other lighter whites. Of course we tasted both. Tapear Having had our palates whet with a lovely Rioja 2005 Reserva (a very good year apparently), we headed up to the terrace to gaze out on the view and try to assimilate the information hitting us via every sense and of course sample some more wine. We settled on a beautiful rose which was just perfect in the heat of the day. The view from the terraza is stunning, overlooking the town of El Ciego, with its sandstone Church set on a backdrop of the Pyrenees. This is a situation where you literally do not know where to look. Architectural marvel on one side, picturesque village and vines on the other. Getting a bit peckish I think…so more tapas….these were 'posh' ones…Sardine terrine & fried idiazabal cheese stuffed with quince paste. The sardine was tasty although not my favourite…as for the cheese. Divine. Words cannot explain. Sorry. Regroup Having barely spent anytime in the room, we headed up to refresh and just enjoy the space. It feels less like a hotel room and more like you are staying in your very cool friend Frank's house. He just happens to have left you a bottle of wine and some complimentary water. We are staying in the Gehry wing and our room looks out over the vines and the winery as opposed to the town of El Ciego. (view mentioned earlier). Super G says it's the kind of place you could write a novel in. The Futbol Spain and Portugal fought it out with Spain emerging victorious after a goal in the second half. We watched this from the comfort of the hotel bar which again, is much more like your cool friend Frank's living room than a hotel bar. There were only a handful of fans, but everyone was fully committed which is what matters most. So Spain hang on and we can continue our journey as well. Dinner By this time it is 10:30 so we go light and opt for the traditional restaurant (as opposed to the Nueva Cocina version). For the first course we share a gorgeous salad with tuna and red peppers - always a delicious combination - and the house croquettes, creamy béchamel chicken and ham. These may be the best I've ever tasted. For second course, we all have fish - merluza - aka hake except for Super G who opts for patitas de cordero. Lamb's feet which were explained to us as lamb shank with some feet as well. Here's the thing. No shank. Just feet, mostly knuckle grisly bits. But the sauce was delicious. Bad ordering not bad food. Dessert - I have Flan, described on the English language menu as 'egg yolk pudding' which I suppose technically, it is. As a Spanish speaker, I insist on getting the Spanish language menu whenever I am in Spain, because I find the English translations often either confuse me or do nothing to whet my appetite. Case in point - 'Clean pig's foot', 'lukewarm shrimp'….they just don't fly in English. The highlight of the dinner was definitely the wine - 150 Anniversary Edition of Marques De Riscal Rioja. Super velvety and yummy. The crowning glory on a magnificent day. We are leaving for Barcelona this morning so I'm up early - 7:30. The streets are quiet, so I wander around a bit and take a few pics of the Pedrera, or as it is also known, Casa Millá. It opens at 9 so I decide to change my initial plan of bocadillo de jamón and slip in early before the people hit. What a treat! Super G and I were the only ones on the Terrace in the morning sun. Every minute since I've been here, it appeared to be thronged with people. I don't know a lot about Gaudí, so I'm not going to comment architecturally, other to say that I like what he did and it's clear to me that he brought nature into everything which his organic shapes. The building is incredible. 5 families actually LIVE here. On the tour, you see the Attic, (my favourite part I think), the terrace and 1 apartment suite (where no-one lives). It's so much better than seeing a social history exhibit in a museum. You can walk right up to the windows and look at Passeig de Gracia - you really can get the experience of what it might have been to have lived here. This was something I didn't expect I'd have time for so I'm feeling delighted to have seen it and enjoyed it so much! with a ham sandwich. At Bar Costa Gallega on the Passeig de Gracia. It was my first meal in Barcelona. A gorgeous, greasy, jamon serrano bocadito (mini sandwich) with crusty, bread and a good slather of tomato and olive oil in the Catalan style.